This Member has requested that you contact their representative about all Exchange work. Reasons for this may include limited supply, seasonal availability, pre-qualification of work or other limiting circumstances that may prevent then from taking all jobs. To learn more and to request a purchasing opportunity from this company, please contact exchange account manager. 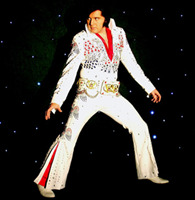 Book this Award winning Elvis Impersonator for your next event.